Blank Slate Press, 9781943075164, 436pp. In exchange for his freedom from a secret Moroccan prison, deep-water salvage diver Jonah Blackwell agrees to lead a covert search for a missing research team in the dangerous coastal waters of Somalia, an area plagued by pirates and a deadly red tide killing all marine life within its reach. But when his expedition threatens the ambitions of billionaire industrialist Charles Bettencourt, Jonah’s survival depends on hijacking a hostile submarine and assembling an unproven crew who must simultaneously investigate the source of a mysterious oceanic plague and face down Bettencourt’s commandos. A thrilling, fast-paced adventure set in the world’s last frontier, THE WRECKING CREW will resonate with James Rollins and Clive Cussler fans alike. Though he loves covering the expeditions of others, Taylor Zajonc enjoys going on his own even more! This passion has translated into this blog, novels, non-fiction writing and speaking. As a maritime historian, Explorers Club member, shipwreck expert and avid world traveler, Taylor Zajonc’s real-life adventures nearly exceed those of his fictional counterparts. His fascination with exploration began when he joined a Russian expedition to the deepest archaeological site on the planet, descending nearly three miles into the abyss of the Bermuda Triangle aboard a Soviet-era submersible. Taylor’s debut novel, The Wrecking Crew is a thrilling adventure set in the world’s last frontier, a story of a deep-water salvage diver set free from a Moroccan prison and forced to lead a covert mission into pirate-infested Somali waters. When his expedition threatens to expose the true source of an oceanic plague, he must assemble an unproven crew of former enemies and fight for the fate of the entire region. This novel is currently under development with Blank Slate Press with a preliminary release date of February 23, 2016. When not writing or hunting long-lost shipwrecks, Taylor can be found at the dog park or training at his local CrossFit box. He loves hearing from people – so if you’d like to book a speaking engagement, ask a question or send a note, please do so at taylor@expeditionwriter.com or@TaylorZajonc. The Wrecking Crew is a depth charge of sheer adventure, delivering you into unique worlds you never thought you'd visit alongside a collection of badass characters you can't help but love. You'll find yourself holding your breath for pages at a time as they effortlessly melt away, and when this one's over, like any good roller coaster, you'll get back in line, ready for more. The Wrecking Crew is a fast paced mystery in the best tradition of Clive Cussler and John Grishom. Well written and scientifically accurate, Taylor Zajonc takes contemporary headlines and environmental issues and weaves them into a roller coaster ride of intrigue and adventure. At times I found myself holding my breathe while turning the page! An exciting, fast-paced, adventure-action novel complete with evil corporate guys, pirates, boats, a submarine, diving, drones, and massive shoot-ups. 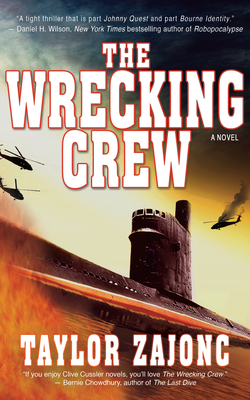 If you enjoy Clive Cussler novels, you'll love The Wrecking Crew. Taylor Zajonc’s debut goes above and beyond the regular shoot-em up by delving into subtle environmental and economic factors affecting 21st century geopolitics. With lovably flawed heroes that jumped off the page, THE WRECKING CREW is smart, highly-readable story of adventure and romance on the high seas. I look forward to the next episode.